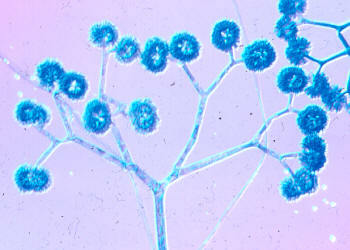 Mucorales invades the cells of people with weakened immune systems and causes the deadly infection, mucormycosis. The study, conducted by LA BioMed and the University of Maryland School of Medicine researchers, identified several pathways that are required for mucormycosis to develop in a patient. The researchers reported on the sequencing of 30 isolates of Mucorales and the study of the transcriptomes of three most common causes of mucormycosis, in response to lung epithelial cells. They identified several pathways that are required for mucormycosis pathogenesis. Those most at risk of mucormycosis are patients with uncontrolled diabetes ketoacidosis, other forms of metabolic acidosis, treatment with corticosteroids, solid organ or bone marrow transplantation, neutropenia, trauma and burns, such as those suffered by wounded soldiers in Iraq and Afghanistan, malignant hematological disorders and deferoxamine therapy in patients receiving hemodialysis.